The Hannes Schneider Meister Cup Race returns to Cranmore Mountain Resort on March 1 and 2 for the 23rd time. 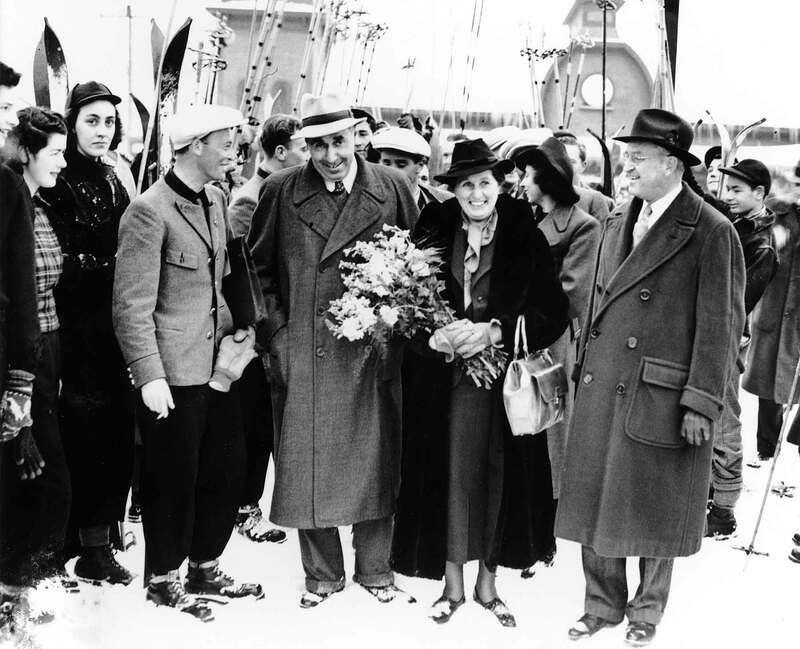 The 2019 event is especially notable because it marks the 80th anniversary of the arrival of its namesake, Austrian ski great Hannes Schneider, in North Conway in 1939. It was February 11, 1939 when Schneider and his family stepped off a train at the depot in North Conway, today’s Conway Scenic Railroad headquarters, and began his second career as ski school director at Cranmore. Memories fade after eight decades, and many today do not know the extraordinary story of Hannes Schneider’s arrest by Nazis in his home town of St. Anton, Austria, the nine months he spent in detention in Germany, and the enthusiasm of skiers worldwide when the news arrived that he had been freed. His release and emigration to America came about through financial negotiations conducted with the German finance minister by North Conway native Harvey Dow Gibson, by then a commanding figure in international banking. Hannes Schneider arrives in North Conway on February 11, 1939. Harvey Dow Gibson, who arranged his release from German arrest, is on the right. The dramatic story is told in detail in the event program of the Hannes Schneider Race, which doubles as the Journal of the New England Ski Museum, the non-profit organization that the race benefits. The publication will be available at Cranmore, the Eastern Slope Inn, and the museum’s Eastern Slope Branch in North Conway. The winter of 1939 is remembered for more than Hannes Schneider’s advent in town: the first professional ski patrol in the country was in its initial winter at Cannon Mountain; Conway’s 30 meter ski jump was destroyed in a windstorm; Cranmore’s Skimobile went into service; and 19 year old Toni Matt electrified the skiers of the region with his straight line run over the Tuckerman Ravine headwall in the American Inferno race. These tales and more can be found in the Schneider Race program. Hannes Schneider was a mountain soldier in Austria in World War I, and his son Herbert and several of his fellow instructors fought in the U.S. 10th Mountain Division in World War II. The Meistercup honors the tradition of mountain and winter warfare-trained soldiers with a special competition between military teams. Schneider’s skiing life in the decades before the invention of ski lifts is remembered at the event with the Friday evening Schneider Sprint, an up and down mountain ski mountaineering race under the lights organized by Ski The Whites. On Saturday March 2 the day begins with an Opening Ceremony at 9:15 a.m. at the base of Mount Cranmore. A color guard from the Army Mountain Warfare School of Jericho, Vermont will place the National and 10th Mountain Division colors on the prominent stage constructed from snow by Cranmore’s proficient grooming crew. Ben Wilcox, general manager of Cranmore, will welcome everyone and those dignitaries attending will be introduced. A plaque honoring Herbert Schneider, Hannes’ son and longtime owner of Cranmore, will be unveiled before it is placed on the summit of the mountain at a later date. The Bavarian Brothers Band plays at the base of the Hannes Schneider race course in 2018. The dual giant slalom race course is located on the Alley, once the site of the Skimobile. Competition is stiff at the upper levels, but all abilities can ski the course with its width and relatively low angle. 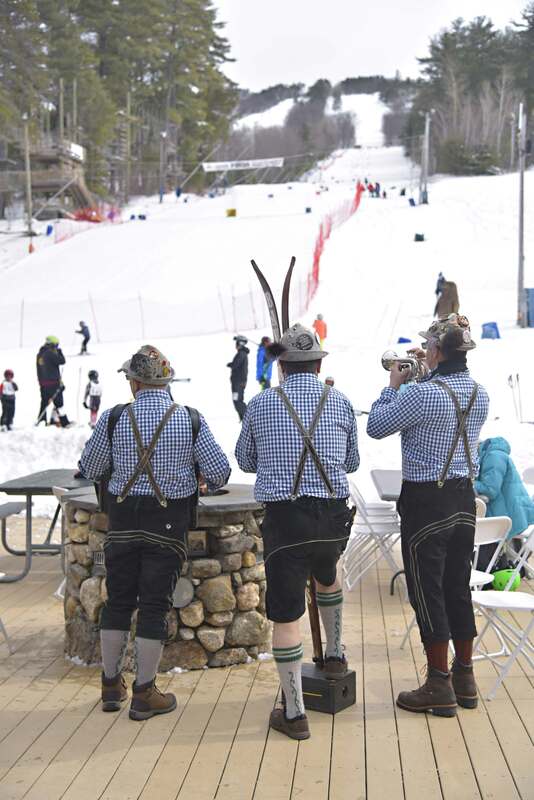 Race entry includes a buffet dinner at the Friday evening reception, and on Saturday an all-day lift ticket, breakfast, lunch and après ski bratwurst, commemorative T-shirt and pin are provided, all for $100. Entry forms can be found on www.meistercup.org. The deadline for entry is February 27, after which registration will cost $125. In addition to the race itself there are activities and pageantry all day. A silent auction with clothing, equipment, gift certificates of interest to skiers runs in the Eating House restaurant from 10:30 to 2:30. People are encouraged to ransack their closets for antiquated ski clothing and take part in the vintage ski contest in the early afternoon. At the awards ceremony at 3 p.m. trophies for the numerous age classes will be presented by Hannes Schneider, great grandson of the Austrian skimeister. All day the alpine-inspired music of the Bavarian Brothers Band adds to the festive atmosphere. There is no cost to attend the event and spectators and Cranmore skiers are cordially invited to be there. The New England Ski Museum is a non-profit, member-supported organization devoted to telling the stories of the history of skiing. 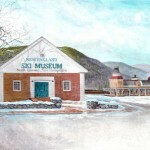 It maintains museums in North Conway and Franconia Notch State Park. The museum thanks the sponsors of the Hannes Schneider Meister Cup Race: Cranmore Mountain Resort, the Schneider Family, the Connie Davis Watson Foundation, Eastern Slope Inn Resort, Tuckerman Brewing Company, Rotary Club of North Conway, the Conway Daily Sun, 93.5 WMWV & Magic 104, Pepsi, World Cup Supply, EMS, Valley Originals, Hill’s RVs, and Ski The Whites.